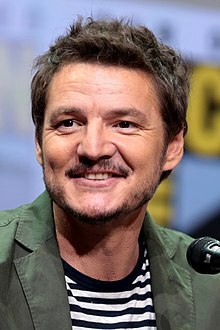 پدرو پاسکال (اینگیلیسجه: Pedro Pascal) آمریکالی اوْیونچو. ۲ آوریل ۱۹۷۵ ‏ ایلینده دۆنیایا گؤز آچیب. 1996–گۆنوموز ایللر آراسیندا سینما ساحه‌سینده چالیشیب. 1999 Good vs. Evil Gregor New Episode: "Gee Your Hair Smells Evil"
Downtown Pedro Balmaceda Voice role; episode: "Hot Spot"
Buffy the Vampire Slayer Eddie Episode: "The Freshman"
2000 Touched by an Angel Ricky Episode: "Stealing Hope"
2001 NYPD Blue Shane "Dio" Morrissey Episode: "Oh Golly Goth"
2006 Law & Order: Criminal Intent Kevin "Kip" Green Episode: "Weeping Willow"
Without a Trace Kyle Wilson Episode: "Candy"
2008 Law & Order Tito Cabassa Episode: "Tango"
2009 Law & Order: Criminal Intent Reggie Luckman Episode: "The Glory That Was..."
2010 Nurse Jackie Steve Episode: "Twitter"
Law & Order: Special Victims Unit Special Agent Greer Episode: "Smoked"
Charlie's Angels Frederick Mercer Episode: "Angels in Paradise"
2012 Body of Proof Zack Goffman Episode: "Falling for You"
CSI: Crime Scene Investigation Kyle Hartley Episode: "Malice in Wonderland"
2013 Nikita Liam Episode: "Aftermath"
Homeland David Portillo Episode: "Tin Man Is Down"
اینگیلیسجه ویکی‌پدیاسی‌نین ایشلدنلری طرفیندن یارانمیش«Pedro Pascal»، مقاله‌سیندن گؤتورولوبدور. ( ۲۲ ژانویه ۲۰۱۸ تاریخینده یوْخلانیلیبدیر). قارداش پروژه‌لرده پدرو پاسکال گؤره داها آرتیق بیلگی‌لر تاپابیلرسینیز. بۇ صفحه‌‌ سوْن دفعه ‏۱۳ مارس ۲۰۱۹، ‏۱۲:۲۸ تاریخینده دَییشدیریلمیشدیر.